Ironic really, that the week before Martian the new Matt Damon film was released, NASA confirm there is water on Mars. Is it just me, or has anyone else noticed the frequency of ‘information’ releases about extraterrestrial life has increased significantly over the last 5 -10 years? I guaranty, give it 20 years and we will be told there is life out there. Quite frankly, I’m gobsmacked NASA didn’t release the fact there are microbes in the water on Mars as it is. I mean, isn’t that a given? What water doesn’t have microorganisms and amoebas in it. 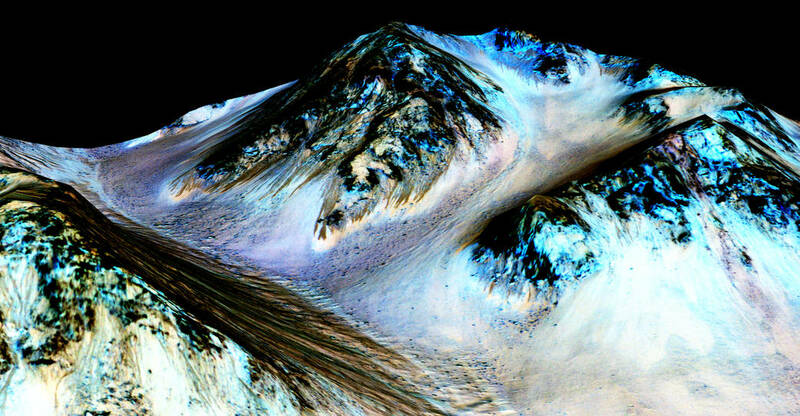 I mean seriously, there isn’t even bacteria in the Martian water??? Doesn’t anyone else find THAT harder to believe than the fact there’s water on the planet? This is one of the photos of Mars taken by NASA. Ah ha. I hate that. Show me the real image, the real colours… why do they assume changing the colours is better than using an arrow to point out what they need to? Changing colours leads to all kinds of wrongly accepted information. Like, did you know the moon isn’t grey?! Yeah. For real. It’s sandy red coloured. You can see that from official Chinese Jade Rabbit photos and video footage – watch the video right through to the end – the second half of the video is in colour and shows the moons real surface colour. 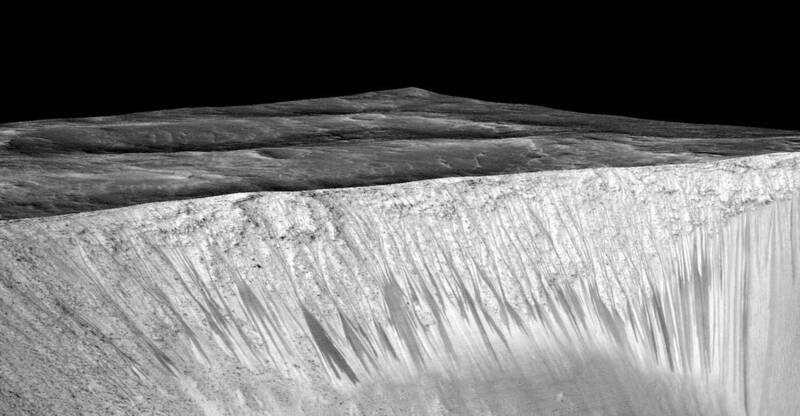 In the photo above, and below, you can see “Dark, narrow streaks…formed by seasonal flow of water on Mars. The streaks are roughly the length of a football field…are formed by briny liquid water” you can read the full story on NASA’s website. In addition, if you want to see some awesome and seriously inspirational photos in a collection, check out Flipboard. “Search for life…. validates what we’ve long suspected.” Yeah… just read that first sentence again, Anyone else notice how he’s admitting by omission the fact they know there is life out there? What’s frustrating, is that they freely admit have the technology to detect what they term ‘signatures’ of salts and minerals in the water. That means they can detect trace or microscopic amounts of minerals You know what that says to me? That they can also detect frigging tiny microorganisms too. 2. It was created by an ancient intelligent civilisation. 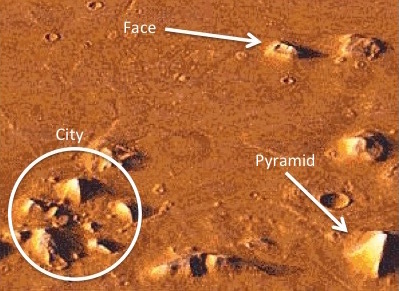 The 2001 photo is said to be more accurate because of increased technology and satellite capability. Photo taken from a google search, arrows edited in by me. I have seen other satellite photos claiming that the face has eyeballs, and some satellite photos which show teeth carved into the sculpture too. The interesting thing is, that despite photos being taken weeks apart, and from opposing angles and in different lighting conditions, the images still seem to show the same thing. A symmetrical object – it looks like a face from either side. All except the newly (2001) published photos, odd, given they have two decades of photos showing roughly the same thing. The thing is even in the newer photos, there are perpendicular lines, and semi circles in it. ERM…. natural erosion does not produce straight lines, perpendicular ones or semi circles that form a perimeter round objects for that matter. Sure maybe one or two of those things might happen in some types of erosion – I am sure someone will be able to find an example of it just to be argumentative. But all of them? What are the odds? On the face of probability, if the face was an isolated object, it’s just about believable that erosion could have done the one in a million thing and produced a face. But wait one…This ‘face’ isn’t an isolated occurrence in the region it’s located on Mars. It is near several other ‘odd’ objects. A pyramid for one, and secondly, what people are claiming is remnants of a city. All these objects have straight edges and non-natural shapes too including other smaller pyramids. I think if the ‘face’ was isolated it may be more convincing that it was a natural freak occurrence, but given that it is near dozens of other objects that appear to be ‘man made’ it makes the ‘erosion’ theory a little harder to swallow. Not sure which camp I sit in, I would be happy to accept either, if only there was some serious, validated and convincing proof one way or another. 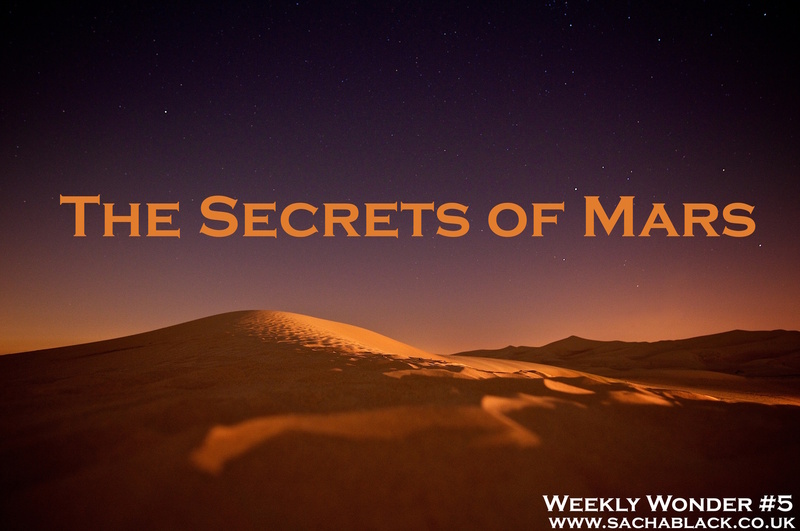 Weekly wonders are meant to inspire my writing, this has given me an explosion of ideas, you could do anything from: Sci-Fi, inspired Mars stories? Maybe humans have run out of space and migrate to Mars, maybe the airs run out, or perhaps we were invaded by an alien race, or maybe someone discovered we actually came from Mars and we decide to migrate back. I hope this has given you some inspiration. Splendid; I can just see the attic room, with you, your coffee flask and cheese sandwiches, scanning dozens of monitors as you scour the universe for life. And…..sarcasm…. What a surprise. Care to make a wager Geoffle? ‘ET Life found’ announced in the next 20 years… Loser buys dinner! happy to buy you dinner and happy to agree life will be found if indeed the briny excretions on Mars are a water-type. But the face? Really. And a city? And Nasa hiding everything but the Chinese showing us the truth? It’s ok, Sacha, you write fantasy. You do it very well! Sigh. How many times… I present evidence, this was balanced too given the arguments for wind erosion, and I also make it clear, as I have said a dozen times to u, I use this for story ideas. The face, by the way, was photographed by NASAAAAAAA. Not me. I was just pointing it out. Also, the Chinese aren’t showing us everything either! I am sure NASA have some colour photos I just couldn’t be bothered to trawl through the JPL website to find them they don’t make them easy to find. U seem to know it all, I didn’t realise u had done so much research on these topics. Tell me, why DO they insist on editing colours? Also why do they always black out all the stars in photography from the surface of the moon? Hmm? And microbes, sure whatever. Ur seriously telling me u think we are the only intelligent life in an infinite universe? Really? Me, a know all? Harsh but probably fair. And what did I say in the first sentence of my response? Yes, I’m happy to agree life will be found. Inevitable I’d say. Now , I’m retired and have a garden to get into; you need to concentrate on work and your career. But thank you for such a happy post. We can at least agree on this: never say never..
https://www.youtube.com/watch?v=cPWnitDyIOw Slati’s last words at 1.38 in this clip say it all! Well I am fascinated by this, and think there could be something in it. We definitely arent the only ones… how could we be? I’m sure wherever and whenever the conditions are right, life will flourish. And leave behind evidence of their own existence. Woah Geoffle! Why are you attacking Sacha? Whether you believe in this stuff or not, lets not get personal. As I said in my comment, wherever the conditions for life are right, life will flourish, leaving behind evidence of its existence for others to find. As an intelligent man, I’m surprised you don’t see this. Space confuses me. But I do think it’s cool. It’s weird to think there may be more out there than we think. I know right. It’s mind blowing! I’d like to see it proved too! But who knows if it will be. I dunno what I think bout all these theories, but I do know they make my brain seriously race with ideas! ooh. Ok thank you I had a quick search – proper weird! really does look like a floating spoon. Its hard to understand the perspective though – and how close or far away those photos are being taken – so the scientists claim its a rock – but how big? because spoons are tiny. Whats your take? floating spoon or wind erosion? What do you think of the face ? I think it will probably prove to just be poor image stitching, but neat to ponder anyway. Re the face, I was a little disappointed that the high res image made the face look much more rock like than face like, but the perimeter still is almost unnaturally uniform. I keep an open mind about these things. Yeah – the photos I find the weirdest are the ones that show the eyeballs and teeth – wish I had had the time to search for them again. If I find them I will link you. They are spectacular. The high res does make it look like a rock, but I am sceptical about those too! haha! Fascinating stuff, Sacha. There is an arrogance that exists still that ours is the only life in existence. We are but a mote in the entire universe. I agree – the Fermi paradox seems ridiculous if you ask me. To be honest I feel like its a moot point – there IS life out there, its only a matter of time till we find it. Whether any of this stuff in our solar system is true – well that I just don’t know. But it does make for good inspirational fodder! haha, can you imagine?! a zoo! that would be so cool – I wish Richard Branson would hurry up and sort out space flights for the general public too! I would love to go up there and see whats really there! It does seem bonkers that theres no life up there – I mean REALLY? extremophiles can survive in the vacuum of space, so theres no way they aren’t on comets and stuff -makes panspermia theory so much more believable. Always enjoy your exploration of the mysteries, Sacha! And I think it supreme arrogance to suppose we are the only life in the universe, absolutely. Thanks Helen, couldn’t agree more. I’m never really sure where I sit with some of these radical ideas, but what I do know, is that there is no way in an infinite universe we are the only ones. ridiculous! Wow, this is fascinating, Sacha. Never knew about the “face of Mars”. To me, it looks like the face of a Cyberman. Okay, I’m a huge Doctor Who fan, but that’s what it reminded me of. Talking of which, Doctor Who had a brilliant episode a few years back called “The Waters Of Mars”. I do believe there is life out there somewhere. There just has to be with the the universe the size it is. I’ve also just heard today that N.A.S.A are going to make a big announcement on Thursday about the recent flypast of Pluto. I just hope they have not been reading “The Truth App”! Hey Hugh, sorry for the epic delay in responding, so behind this week, still nothing scheduled for next week either :s argh. Can’t believe you didn’t know about the face – I would have thought you did, thats awesome then, glad I posted about it. oooh really?! its funny isn’t it? I thought it was really ironic too that they released the martian film that week too! No, never heard the NASA announcement. However, my partner said he did and that it had something to do with that silly story “The Truth App!” I didn’t know what to say to that. Where do you get this stuff from, Sacha? Thought-provoking – and imagination-provoking – as ever. I love your posts on tis – I’m interested in that face though. Whether it’s natral or not it’s got point son interest on its’ own. It’s looks a bit like the rebel base from the Emprire Strikes Back buried in sand. I’t slike three blocks joined in the middle. The other thing is if it’s natual it’s either not formed in the same way as the surrounding city and pyramid or it’s not eroded in the same way. Everyhting else near it is jagged and pointy, the face is flat. It’s very weird though. If we did leave Mars 1000’s of years ago or more everything would be buried, like these things are. But it’s as I said before why does Mars look so familiar? I thought I had replied to this message. Soz. In my opinion, there is no freaking way that thing is natural. Also, I have no doubt this new photo has been tampered with by NASA so they can now claim that ‘new’ technology has made it more accurate, and by more accurate I mean not look like a face. Load of rubbish. Its a face, and we all know it. I get what you’re saying, it might have been tampered with. But I can still see how it could be a face. Also, Mars doesn’t have much of an atmosphere but it has some violent sand storms, often lasting days. There’s so much to discover about Mars and I think we have some shocks coming. But the pyramids on earth make more sense if they we’re built by the same people as on Mars. hmm, I wasn’t sure about storms. I wonder how that works then without an atmosphere? Yeah, I knew it had a thin one, because of that thing I’d read about it having had a really thick one in the past, but for some reason I equated thin with virtually nothing and therefore no wind. silly me. Ha, sometimes we get a brain fart eh? 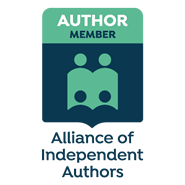 I’m looking forward to talking to you about this.